Blessed Newman composed “Twelve Meditations and Intercessions for Good Friday.” He explained that they could be used, adding two others, as considerations for the fourteen stations of the Cross. Each one of the considerations explains a truth about the Son of God, and concludes with a prayer. Today we limit ourselves to reading the complete passage. “BEHOLD the Lamb of God, behold Him who taketh away the sins of the world. So spoke St. John Baptist, when he saw our Lord coming to him. And in so speaking, he did but appeal to that title under which our Lord was known from the beginning. Just Abel showed forth his faith in Him by offering of the firstlings of his flock. Abraham, in place of his son Isaac whom God spared, offered the like for a sacrifice. The Israelites were enjoined to sacrifice once a year, at Easter time, a lamb—one lamb for each family, a lamb without blemish—to be eaten whole, all but the blood, which was sprinkled, as their protection, about their house doors. The Prophet Isaias speaks of our Lord under the same image: “He shall be led as a sheep to the slaughter, and shall be dumb as a lamb before his shearers” (liii. 7); and all this because “He was wounded for our iniquities, He was bruised for our sins; … by His bruises we are healed” (liii. 5). And in like manner the Holy Evangelist St. John, in the visions of the Apocalypse, thus speaks of Him: “I saw, … (Apoc. 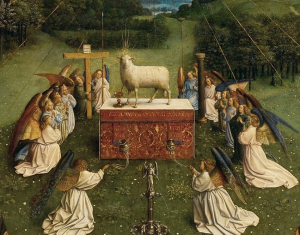 v. 6), and behold a lamb standing as it were slain;” and then he saw all the blessed “fall down before the Lamb,” … (verses 8, 9), and they sung a new canticle saying, “Thou wast slain, and hast redeemed us to God in Thy blood, out of every tribe and tongue and people and nation” (verse 9) … Worthy is the Lamb that was slain, to receive power, and divinity, and wisdom, and strength, and honour, and glory, and benediction” (verse 12). This is Jesus Christ, who when darkness, sin, guilt and misery had overspread the earth, came down from Heaven, took our nature upon Him, and shed His precious blood upon the Cross for all men. Let us pray for all pagan nations, that they may be converted. Agnus Dei qui tollit peccata mundi — Jesus as the Lamb is one of my favorite images of our Lord … the lamb without blemish caught in the thicket .. these are lovely words from Cardinal Newman …. Thank you for this meditation. Lord, that the world might see! Mundus videat! From blood sprinkled door posts to blood shed in the same form on a cross we see salvation history culminate in the greatest act of love known. Let us not fear the depth of this love that invites us to the same cross that we may be truly free. Look forward to more from Newman!